This portrait, painted by the Swedish artist Adolf Ulrik Wertmüller in 1785, was generally ill-received by contemporary critics and, to judge by Marie-Antoinette's monstrous headgear, was a bit of a turkey in more ways than one! If it was a flop, it was certainly a big one - at 9 feet by 6 feet plus, with lifesize figures, this is a substantial canvas. Thanks to the Google "Cultural Institute" site you can now visit it in situ in the Swedish Nationalmuseum - just click on the little yellow man to be deposited at Marie-Antoinette's feet! Definitely a disconcerting experience! There is an almost equally large copy in Versailles, painted in 1868 by Eugène Battaille and once belonging to the Empress Eugenie. In the 1780s the Queen was in desperate need of a new more appealing image to counter the rising tide of popular hostility. Various artists were tried, among them, besides Vigée-Lebrun, a number of Swedes resident in France: Alexander and Joseph-Marie Roslin, the miniaturist Adolphe Hall and Adolf Ulrik Wertmüller. The son of a wealthy apothecary, Wertmüller (1751-1811) had first come to Paris in 1772 to study under his second cousin Roslin and later with the the famous landscape artist Joseph-Marie Vien. In 1775, he journeyed to Rome where Vien had been made director of the French Academy. King Gustav III had intended this to be Wertmüller’s ticket to a successful career in Paris, but jealousies abounded. When the picture appeared in the salon of August 1785, it was was attacked by the critics. While a few admired the portrayal of a more maternal and complaisant Queen - no doubt the effect intended - the majority felt the pose lacked in dignity. The garden setting, far from reassuring, recalled the intrigues of the newly erupted Diamond Necklace scandal. Marie-Antoinette herself was also unimpressed. According to the Mémoires secrets pour servir à l’histoire de la République des lettres, she did not even recognise herself. She was reported to have exclaimed, “C’est moi, là?” Payment was delayed. The artist fell into a deep depression, but recovered enough to make some necessary changes - adjusting the angle of the Queen's head and blending the Temple of Love discreetly into the background - before the portrait was dispatched to Sweden the following year. Maybe bulging eyes are hereditary? Olivier Blanc, Portraits des femmes : artistes et modèles à l'époque de Marie-Antoinette (2006), p.146-8. 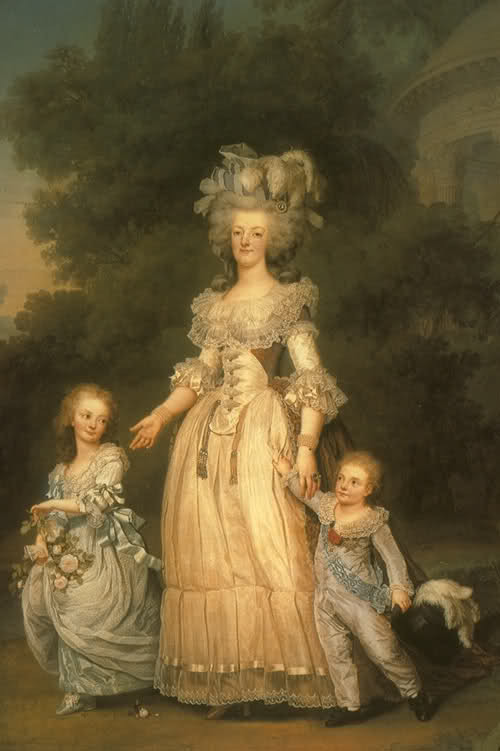 Portrait of Marie-Antoinette and her children, by Wertmuller Nationalmuseum, Stockholm. Paintings of Wertmüller in Louis XVI et Marie-Antoinette à Compiègne (RMN, 2006), catalogue of an exhibition held at the Château de Compiègne 25 Oct 2006 - 29 Jan 2007. Posted on La folie XVIIIe forum. What an interesting portrait, never seen it before! 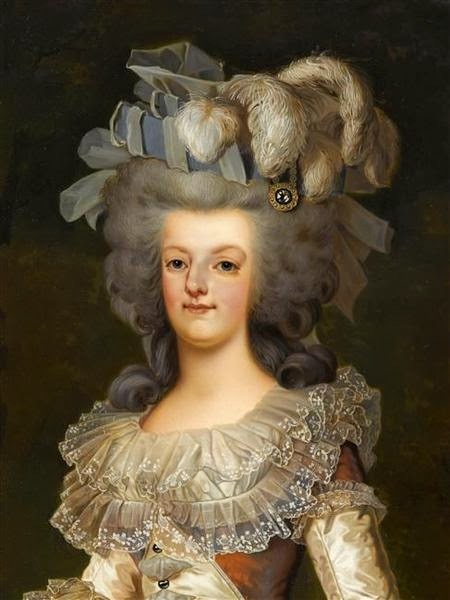 It looks quite unflattering - was Marie Antoinette beautiful, by the standards of her time? Hello again. No, I don't think she was - even those favourably disposed towards her said she was pretty or attractive rather than conventionally beautiful. Antonia Fraser's biography has a summary of her appearance based on Maria-Theresa's assessment and other contemporary sources. According to this, she had large, well-spaced eyes, a subtle blue-grey, with an attractive misty look due to short-sightedness. Her hair was thick and a favourable light ash colour, which would darken in later years, though she suffered from a unfashionably high forehead and uneven hairline. She had an aquiline nose which could be taken as distinguished. However, there was no disguising that Hapsburg jaw with its pouty projecting lower lip. Marie-Antoinette herself apparently came to feel that she had a haughty "high-nosed" look which did not reflect her personality. Artists got round this by depicting her in profile "which is why it is much easier to comprehend the reality of Marie-Antoinette's appearance - if not her allure - from the busts" ("Marie-Antoinette" p36-7 in the pbk).